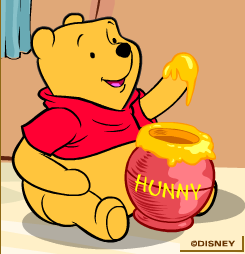 What could be better than Eating Honey? I have been reflecting on the past few #mathchat sessions, as well as other education chats and comments, and more and more I am coming to the conclusion that education may be reformed, but it will never work. The problem, as I see it, is that education is basically an institution, a collection of vested and disparate interests all fighting and pushing against each other for limited resources. In the process, teachers get ‘bashed’, subject areas get sidelined or cut from budgets, schools start scrabbling about for crumbs of support… in all of this, the student seems to have been forgotten. There is a light at the end of the tunnel, though, and it’s not an oncoming train. Interactions I have had with colleagues on #mathchat suggest that it is possible to change your style of teaching even in times of close scrutiny and limited finances. The secret is at the same time simple and difficult – total focus on the learner. For most of us on #mathchat, the sharing of stories about how we came to love mathematics, the pain of hearing about those who are physically sick at the thought of mathematics, the pride we take in fighting our corner are not just cathartic experiences for us, they are also signs that others like us can do something to bring about change, within our own classrooms and our own community, to make life better for our learners. Yes, I am all for improving the system in which education happens, but learning of something will always happen despite, or because of, the system. We have an opportunity to determine what that ‘something’ is going to be. What I am going to focus my energies on is transforming the learning experience for each of my students, and I include myself in that group, such that the learning environment is safe, friendly and conducive to becoming better people. There are always ways to tweak a lesson or a situation towards a more positive learning experience, it is a matter of being prepared to look for them. I am already picturing my Monday morning class, with eager faces ready to share their weekend with me and looking forward to another week at school. That’s probably not a normal image for a maths teacher, or any other teacher for that matter, but I am convinced that the shift to the positive we want to see on the outside, has to begin on the inside. Learning is, or ought to be, a life-long process that people see as being useful and valuable for them. Education is a product. Everyone has the ability to learn, whether or not they are given the chance to is where the real transformation of the system is going to happen. I, for one, am going to work a lot more on the content and the process. This entry was posted in Education, Random thoughts and tagged #mathchat, CPD, education, education reform, learning, REBELS, reform, teaching. Bookmark the permalink.